As a retired pilot with TWA, 77 year old Bill Kinkead has been accustomed to altitude, something he very much loves. 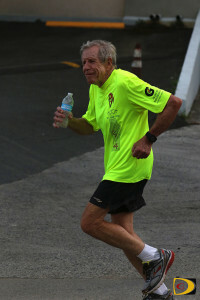 And for the last two years, he has been tackling the hills on St. John in the annual 8 Tuff Miles race. He placed third in his age group both times, but, is eyeing the top spot in this year. Preparing for the St. John race is easy Kinkead said, because he lives at Lambert, which is 600 feet in elevation from the resort to the Prison at Balsam Ghut. What he likes about the 8 Tuff Miles? He got that competitive spirit as a cyclist after living for 10 years in France, following retirement. He said he had a small recreational vehicle and during the summer, would go camping. There’d be a number of cycling races from 150-270 kilometers—all amateur events.